July 10, 2017, 9:06 p.m.
A couple weeks ago, GQ ran an article titled "How Patagonia Became Fashion’s Favorite Outdoor Brand." The general gist: Patagonia is stylish, yes, but it also embodies a strong environmental ethos. In other words, it&apos;s both cool and responsible. 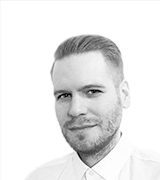 To the extent that a brand&apos;s customer base helps define a brand&apos;s overall image and reputation, fresh data from YouGov can corroborate GQ&apos;s claim. Looking at various attitudes toward fashion, the numbers suggest that current and former Patagonia customers consider themselves a fashionable bunch. Indeed, 61% identify as well-dressed individuals, compared to 58% of US adults in general. 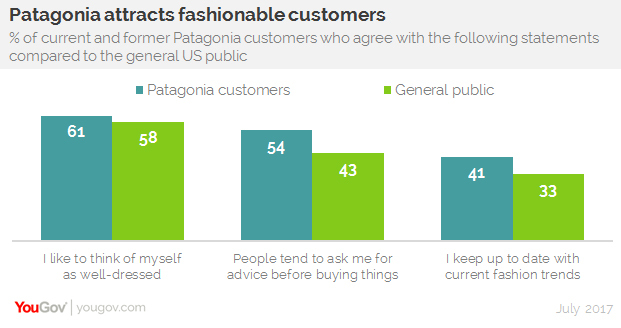 Patagonia customers are also more likely to report that people tend to ask them for advice before making a purchase, and that they keep up with the recent fashion trends. 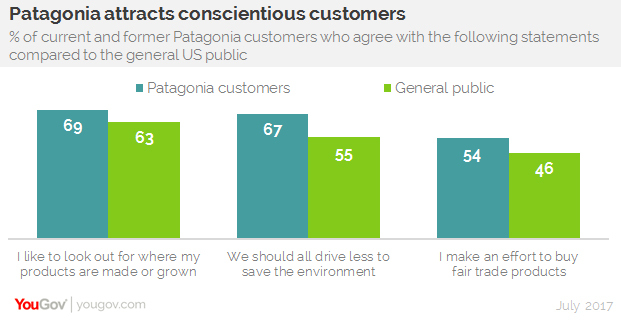 When it comes to being an ethical consumer, 69% of Patagonia customers (both current and former) say they like to look out for where their products are made or grown, while the same is true for 63% of the general public. 67% believe we should drive less to save the environment, and, at 54%, a slight majority make an effort to buy fair trade products. Additional data shows that current and former Patagonia customers are perfectly split along gender lines: 50% male; 50% female. 75% live in either a city or suburb, while the rest live in either a town or rural area, and one-third are Millennials aged 18-34. The brand appears to be least popular in the Midwest. Patagonia customers show something else: a willingness to spend. When asked if they have a strict budget when they go shopping, only 43% agreed, compared to 58% of the general US public.